A Claus for celebration! Our first Holly Jolly American Traditions Christmas Special featuring Kim Michael Polote, 2001 Gold Medal winner in The American Traditions Competition with a guest appearance by Mr. Jim Wann, Broadway lyricist, composer, performer, and judge for the American Traditions competition. A native of Savannah, Georgia, Kim Michael Polote is a professional singer, a Nashville recording artist, motivational speaker, actress, preservationist and entertainer. 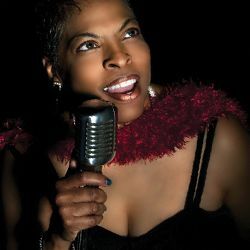 Her live performances have been nationally aired on the Travel Channel’s Emmy-award winning Great Hotels and the Food Network’s Emmy award-winning Paula Deen’s Cooking. From opening for Al Green to performing for President Jimmy Carter at his church in Plains Georgia, Kim has been the entertainer of choice for a multitude of dignitaries.